Brno. Jus Municipale Moravicum sive Brunnense. [Nuremberg]: [Georg Stuchs], [c. 1498]. 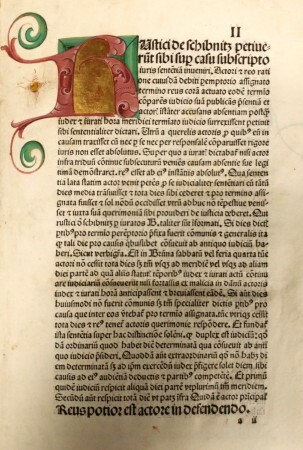 The floriated initial “R” begins the text of Jus Municipale Moravicum. The newest incunabulum in the Law Library’s collection is a record of the laws of Brünn, or Brno, the historical capital city of Moravia. Printed in Nuremberg in approximately 1498, Jus Municipale Moravicum presents an alphabetically-ordered collection of the legal maxims and judicial decisions of the Schöffenrat of Brno. It was based on prior compilations of municipal laws, and first was assembled and produced in manuscript in the mid-fourteenth century by Brno notary Johann von Brünn, and later was enlarged. This collection focuses on the principal municipal laws of Brno, including town court proceedings, the law of property, the law of persons, and enforcement of court decisions. The work is known by several names, including Ius Municipale Moraviae, Brünner Schöffenbuch, and Jus Municipale Brunnense. The binding of Jus Municipale Moravicum features blind-tooled leather with protective hardware in the form of diamond-shaped floriated brass corner-pieces and two clasps to relieve strain on the joints of the book. Brno, a city with a thousand-year history, today is the second largest city in the Czech Republic and the largest Moravian city. At the time the book was printed, power in the Margraviate of Moravia was divided between the towns of Brno and Olomouc. Eventually Brno became the capital city of Moravia, and today it serves as the judicial center of the Czech Republic, hosting the Constitutional Court, the Supreme Court, the Supreme Administrative Court, and the Supreme Public Prosecutor’s Office. 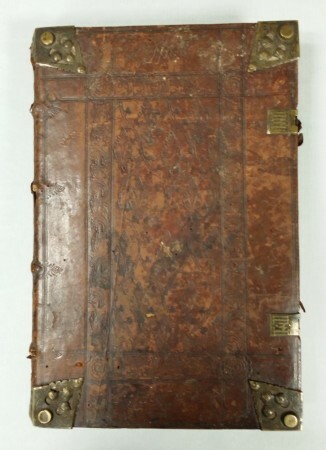 The binding of the Law Library’s copy of Jus Municipale Moravicum features blind-tooled leather over square-edge wooden boards with floriated brass corner-pieces. The illuminated letter “R” which commences the first sentence of the book, “Rustici de schibnitz petiueru[n]t sibi su[per] casu subscripto iuris sente[n]tia[m] inueniri…” is faintly floriated, and appears in shades of pink with green flourishes surrounding a gold leaf center, all against a green field. The work is rubricated throughout. Two full-page woodcuts, of an arbor consanguinitatis and an arbor affinitatis, appear toward the end of the volume, printed as “regular” pages with text on the verso. This incunabulum is one of four copies in the United States; the others are held by the Huntington Library, the Harvard Law School Library, and the University of Pennsylvania Library. As of this writing, the Law Library’s collection of incunabula numbers nearly 180 titles. 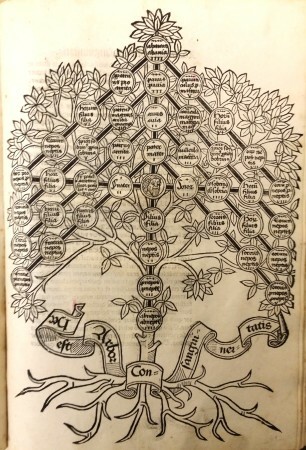 The tree of consanguinity, depicting blood relationships within a family, was used to determine whether prospective spouses could marry legally according to how many degrees separated the parties. 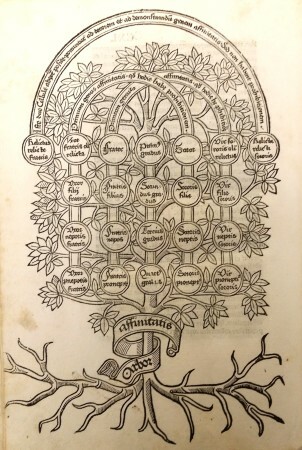 “Affines” – relatives by marriage or sexual relations – populate the tree of affinity, which highlights which of these relatives could not marry legitimately. NY: Royal Historical Society/Boydell Press, 2010.